Can be used with Parallax 7400 series or ANY deck mount converter system without "built-in" DC load distribution panel. Wires 12 independently fused DC circuits. Ideal for replacing a converter/charger that contains an internal fuse panel with a converter/charger that does not. Maximum 20A load per circuit (fuses not supplied with unit) with a total capacity of 85 amps. Includes a hinged lid that snaps into place, three DC positive terminals and a chassis mounted ground terminal bus. It's a great value and a quality product! The unit is perfect for lots of applications and certainly fills the bill for new charging systems that have no fuse panels. 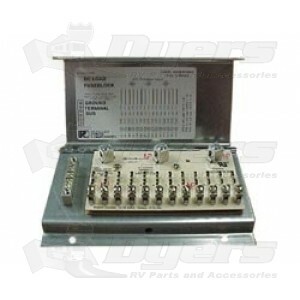 I have been looking for a 12v distribution panel and this is just what I needed for my Silver Streak travel trailer. The old charging system had a fuse box built in, but he new charging systems do not. So this takes care of the problem of fused distribtion.